It is common knowledge that there are many activities that can present danger in the industrial workplace. One such danger is the high occurrence of eye injuries which can be caused by a range of practices including welding and grinding. Due to the high temperatures, speed and materials involved in the welding process, there are many dangers that workers need to be aware of. Welding spatter can cause nasty injuries and without sufficient protection, the spatter could easily enter the eye of both the welder and also other workers in the near vicinity. In order to avoid potential injury, welders are strongly advised to wear suitable eye protection when engaged in any of these, or other hazardous activities. Other workers in the vicinity of these activities should also be wearing eye protection. The eye protection used should be of the relevant safety standards and impact resistance. It is also recommended that when workers are wearing a welding helmet that they either have both a welding lens that can flip up to reveal a clear lens or else wear a pair of safety glasses under the helmet. 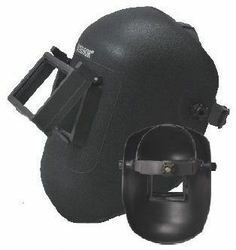 Our Products range includes Welding Face Shield with Ratchet Head Band, Helmet attachable Welding Shield & Auto-darkening Welding Shield of Karam & Honeywell make. Sturdy and light weight along with adjustable ratchet head gear. Standard vision 110 mm x 85mm available in black colour only. Looking for Welding Shields ?